This article is about the raid. For the recruitable character, see Macula Marius. For the summon stone, see Macula Marius (Summon). 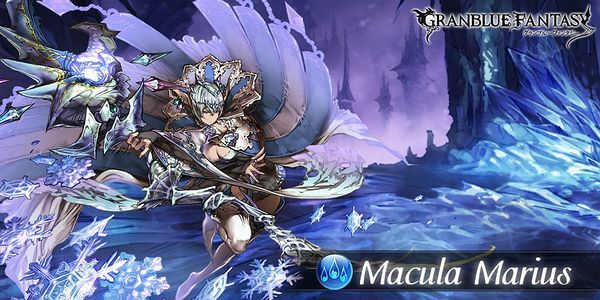 For the summer summon stone, see Macula Marius (Summer). Macula Marius is a raid on the Auguste Isles at the top area, Auguste Falls. If you own the Macula Marius summon, hosting and defeating Macula Marius will unlock the summon's blue star. Location: Chapter 12: Auguste Isles - Auguste Falls Start QuestNetwork Errors will appear if the hosting conditions are not met. Big Water damage to all allies for around 20,000 (40,000 when triggered by Glacial Seal). for 5 turns. Medium chance to hit. Casts And The World Stood Still. 吹き荒べ、銀に染める凍てつく風よ Blow fiercely, O wind that freezes everything to silver. わらわの作る結晶は美しかろう…？　じきに其方らも、美しくしてくれるぞ… Are the crystals I create not beautiful? Soon, you shall become as lovely as they. 氷星の煌杖よ、その輝きは無欠なる六花の如く！ O Froststar Staff, your brilliance becomes as flawless as the snow! ふっふふふふふ、やりおるわ Ha-hahahahaha, you dare to do this? うふっふ…、見事だ、隣人よ Aha ha... That was splendid, skydweller. This page was last modified on 16 April 2019, at 21:26.